The Dutch East India Company ( or VOC in Dutch, literally "United East Indian Company") was a chartered company established in 1602, when the States-General of the Netherlands granted it a 21-year monopoly to carry out colonial activities in Asia. It was the first multinational corporation in the world and the first company to issue stock. It was also arguably the world's first megacorporation, possessing quasi-governmental powers, including the ability to wage war, negotiate treaties, coin money, and establish colonies. The Dutch East India Company remained an important trading concern for almost two centuries, paying an 18% annual dividend for almost 200 years. In its declining years in the late 18th century it was referred to as Vergaan Onder Corruptie (referring to the acronym VOC) which translates as 'Perished By Corruption'. 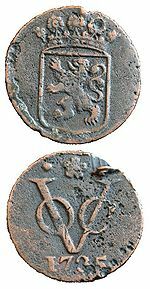 The VOC became bankrupt and was formally dissolved in 1800, its possessions and the debt being taken over by the government of the Dutch Batavian Republic. The VOC's territories became the Dutch East Indies and were expanded over the course of the 19th century to include the whole of the Indonesian archipelago, and in the 20th century would form Indonesia . Likewise, as Portugal had been "united" with the Spanish crown, with which the Dutch Republic was at war, in 1580, the Portuguese Empire became an appropriate target for military incursions. These three factors formed motive for Dutch merchants to enter the intercontinental spice trade themselves at this time. Finally, a number of Dutchmen like Jan Huyghen van Linschoten and Cornelis de Houtman obtained first hand knowledge of the "secret" Portuguese trade routes and practices, thereby providing opportunity. The stage was thus set for Houtman's first voyage to Banten , the chief port of Java , and back (1595–97), which generated a modest profit. In 1596, a group of Dutch merchants decided to try again to circumvent the Portuguese monopoly. In 1596, a four-ship expedition led by Cornelis de Houtman was the first Dutch contact with Indonesia. The expedition reached Banten , the main pepper port of West Java, where they clashed with both the Portuguese and indigenous Indonesians. Houtman's expedition then sailed east along the north coast of Java , losing twelve crew to a Javanese attack at Sidayu and killing a local ruler in Madura . Half the crew were lost before the expedition made it back to the Netherlands the following year, but with enough spices to make a considerable profit. In 1598, an increasing number of new fleets were sent out by competing merchant groups from around the Netherlands. Some fleets were lost, but most were successful, with some voyages producing high profits. In March 1599, a fleet of twenty-two ships under Jacob van Neck of five different companies was the first Dutch fleet to reach the ‘Spice Islands’ of Maluku. The ships returned to Europe in 1599 and 1600 and, although eight ships were lost, the expedition made a 400 percent profit. In 1600, the Dutch joined forces with the local Hituese (near Ambon ) in an anti-Portuguese alliance, in return for which the Dutch were given the sole right to purchase spices from Hitu. Dutch control of Ambon was achieved in alliance with Hitu when in February 1605, they prepared to attack a Portuguese fort in Ambon but the Portuguese surrendered. In 1613, the Dutch expelled the Portuguese from their Solor fort, but a subsequent Portuguese attack led to a second change of hands; following this second reoccupation, the Dutch once again captured Solor, in 1636. 1603, the first permanent Dutch trading post in Indonesia was established in Banten , West Java and in 1611, another was established at Jayakarta (later 'Batavia' and then 'Jakarta'). In 1610, the VOC established the post of Governor General to enable firmer control of their affairs in Asia. To advise and control the risk of despotic Governors General, a Council of the Indies (Raad van Indië) was created. The Governor General effectively became the main administrator of the VOC's activities in Asia, although the Heeren XVII continued to officially have overall control. In 1604, a second English East India Company voyage commanded by Sir Henry Middleton reached the islands of Ternate , Tidore , Ambon and Banda ; in Banda, they encountered severe VOC hostility, which saw the beginning of Anglo-Dutch competition for access to spices. From 1611 to 1617, the English established trading posts at Sukadana (southwest Kalimantan), Makassar , Jayakarta and Jepara in Java , and Aceh, Pariaman and Jambi in Sumatra which threatened Dutch ambitions for a monopoly on East Indies trade. Diplomatic agreements in Europe in 1620 ushered in a period of cooperation between the Dutch and the English over the spice trade.This ended with a notorious, but disputed incident, known as the 'Amboyna massacre', where ten Englishmen were arrested, tried and beheaded for conspiracy against the Dutch government. Although this caused outrage in Europe and a diplomatic crisis, the English quietly withdrew from most of their Indonesian activities (except trading in Bantam) and focused on other Asian interests. In 1619, Jan Pieterszoon Coen was appointed Governor-General of the VOC. He was a man of extraordinary vision, far beyond that of the cautious directors at home. He saw the possibility of the VOC becoming an Asian power, both political and economic. He was not afraid to use brute force to put the VOC on a firm footing. On 30 May 1619, Coen, backed by a force of nineteen ships, stormed Jayakarta driving out the Banten forces, and from the ashes, established Batavia as the VOC headquarters. To establish a monopoly for the clove trade, in the 1620s almost the entire native population of the Banda Islands , the source of nutmeg was deported, driven away, starved to death, or killed in an attempt to replace them with Dutch plantations, operated with slave labour.He hoped to settle large numbers of Dutch colonists in the East Indies, but this part of his policies never materialized, because the Heren XVII were wary at the time of large, open-ended financial commitments. Another of Coen's ventures was more successful. A major problem in the European trade with Asia at the time was that the Europeans could offer few goods that Asian consumers wanted, except silver and gold. European traders therefore had to pay for spices with the precious metals, and this was in short supply in Europe, except for Spain and Portugal. The Dutch and English had to obtain it by creating a trade surplus with other European countries. Coen discovered the obvious solution for the problem: to start an intra-Asiatic trade system, whose profits could be used to finance the spice trade with Europe. In the long run this obviated the need for exports of precious metals from Europe, though at first it required the formation of a large trading-capital fund in the Indies. The VOC reinvested a large share of its profits to this end in the period up to 1630.The VOC traded throughout Asia. Ships coming into Batavia from the Netherlands carried supplies for VOC settlements in Asia. Silver and copper from Japan were used to trade with India and China for silk, cotton, porcelain, and textiles. These products were either traded within Asia for the coveted spices or brought back to Europe. The VOC was also instrumental in introducing European ideas and technology to Asia. The Company supported Christian missionaries and traded modern technology with China and Japan. A more peaceful VOC trade post on Dejima , an artificial island off the coast of Nagasaki, was for more than two hundred years the only place where Europeans were permitted to trade with Japan. In 1640, the VOC obtained the port of Galle , Sri Lanka , from the Portuguese and broke the latter's monopoly of the cinnamon trade. In 1658, Gerard Hulft laid siege to Colombo , which was captured with the help of King Rajasinghe II of Kandy . By 1659, the Portuguese had been expelled from the coastal regions, which were then occupied by the VOC, securing for it the monopoly over cinnamon.To prevent the Portuguese or the English from ever recapturing Sri Lanka, the VOC went on to conquer the entire Malabar Coast upon the Portuguese, almost entirely driving them from the west coast of India. When news of a peace agreement between Portugal and the Netherlands reached Asia in 1663, Goa was the only remaining Portuguese city on the west coast. VOC trading posts were also established in Persia (now Iran ), Bengal (now Bangladesh , but then part of India), Malacca (Melaka, now in Malaysia ), Siam (now Thailand ), mainland China (Canton ), Formosa (now Taiwan ) and the Malabar Coast and Coromandel Coast in India. In 1662, however, Koxinga expelled the Dutch from Taiwan (see History of Taiwan). Around 1670, two events caused the growth of VOC trade to stall. In the first place, the highly profitable trade with Japan started to decline. The loss of the outpost on Formosa to Koxinga and related internal turmoil in China (where the Ming dynasty was being replaced with the Qing dynasty ) brought an end to the silk trade after 1666. Though the VOC substituted Bengali for Chinese silk other forces affected the supply of Japanese silver and gold. The shogunate enacted a number of measures to limit the export of these precious metals, in the process limiting VOC opportunities for trade, and severely worsening the terms of trade. Therefore, Japan ceased to function as the lynchpin of the intra-Asiatic trade of the VOC by 1685. However, the writing was on the wall. Other companies, like the French East India Company and the Danish East India Company also started to make inroads on the Dutch system. The VOC therefore closed the heretofore flourishing open pepper emporium of Bantam by a treaty of 1684 with the Sultan. Also, on the Coromandel Coast, it moved its chief stronghold from Pulicat to Negapatnam , so as to secure a monopoly on the pepper trade at the detriment of the French and the Danes. However, the importance of these traditional commodities in the Asian-European trade was diminishing rapidly at the time. The military outlays that the VOC needed to make to enhance its monopoly were not justified by the increased profits of this declining trade. The VOC had two types of shareholders: the participanten, who could be seen as non-managing partners, and the 76 bewindhebbers (later reduced to 60) who acted as managing partners. This was the usual set-up for Dutch joint-stock companies at the time. The innovation in the case of the VOC was, that the liability of not just the participanten, but also of the bewindhebbers was limited to the paid-in capital (usually, bewindhebbers had unlimited liability). The VOC therefore was a limited-liability company. Also, the capital would be permanent during the lifetime of the company. As a consequence, investors that wished to liquidate their interest in the interim could only do this by selling their share to others on the Amsterdam Stock Exchange . The VOC consisted of six Chambers (Kamers) in port cities: Amsterdam , Delft , Rotterdam , Enkhuizen , Middelburg and Hoorn . Delegates of these chambers convened as the Heeren XVII (the Lords Seventeen). They were selected from the bewindhebber-class of shareholders. The raising of capital in Rotterdam did not go so smoothly. A considerable part originated from inhabitants of Dordrecht . Although it did not raise as much capital as Amsterdam or Zeeland, Enkhuizen had the largest input in the share capital of the VOC. Under the first 358 shareholders, there were many small entrepreneurs, who dared to take the risk. The minimum investment in the VOC was 3,000 guilders, which priced the Company's stock within the means of many merchants. Among the early shareholders of the VOC, immigrants played an important role. Under the 1,143 tenderers were 39 Germans and no fewer than 301 Zuid-Nederlanders (roughly present Belgium and Luxemburg , then under Habsburg rule), of whom Isaac le Maire was the largest subscriber with ƒ85,000. VOC's total capitalization was ten times that of its British rival. The logo of the VOC consisted of a large capital 'V' with an O on the left and a C on the right leg. The first letter of the hometown of the chamber conducting the operation was placed on top (see figure for example of the Amsterdam chamber logo). The flag of the company was orange, white, blue (see Dutch flag) with the company logo embroidered on it. In the context of the Dutch-Portuguese War the company established its headquarters in Batavia, Java (now Jakarta , Indonesia ). Other colonial outposts were also established in the East Indies, such as on the Spice Islands (Moluccas ), which include the Banda Islands , where the VOC forcibly maintained a monopoly over nutmeg and mace. Methods used to maintain the monopoly included the violent suppression of the native population, not stopping short of extortion and mass murder. In addition, VOC representatives sometimes used the tactic of burning spice trees in order to force indigenous populations to grow other crops, thus artificially cutting the supply of spices like nutmeg and cloves. Mondo Visione web site: Chambers, Clem. "Who needs stock exchanges?" Exchanges Handbook. -- retrieved 1 February 2008.